Astronomer/Historian Bill Sheehan's two-week sojourn on Mt. Hamilton during the 2003 close approach of Mars was such an inspiration and delight that we locals were sad to see him depart. Not only would we miss Bill, but it also meant that this extraordinary project was drawing to a close. He left something of considerable value behind - a few remaining nights of allotted telescope time! Collaborator Tony Misch's other duties on the mountain prevented him from completing the run, and with their generous invitation I found myself alone in the big dome peering at Mars through the Great Refractor. I have no expertise in planetary observation whatsoever, but I have studied and worked in visual arts all my life. Even as tools and papers were prepared for the evening's task, I intentionally maintained Martian geographical naivet� (ignorance is a more accurate word!). I was hoping to reinvent the experience of early observers whose knowledge was not informed and defined by precise satellite images. I can guarantee that the renderings were fully of the moment, eye to hand, recording what was seen and not what was known. In preceding weeks I had been seduced by the planet's pink luminosity, and I found myself preferring a filterless view. How could one recreate this delicate rouge on paper? Mars itself provided the answer. Red iron oxide was the obvious mineral with which to develop what Rem Stone cleverly dubbed la tabula rosa, a blank pigmented field that would serve as a median foundation. Fe2O3 was very familiar. I had used it for many years as a ceramic artist and had far more pure powder on hand than the smidgen needed. Rust is such great stuff! If several sheets of tabulas rosas could be prepared in advance, it would save precious time at the eyepiece. 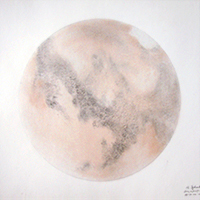 I first determined that iron-stained paper could be sufficiently erased to reveal white features such as Mars' polar ice cap. Now confident of this approach, I tested a number of specialized papers, but decided on generic art store tablet drawing media. 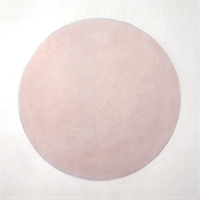 A thick, heavy circle was drawn with graphite around a 10-inch bowl template, after which the entire paper surface was sanded to subdue tooth and texture. This also diminished the circumference line to a subtle, appealing suggestion of border -- more like the planet itself. (This is hidden by the black mask in the website images.) A bit of paper towel and chamois were dipped in dry ferrous dust and lightly stroked across the paper. Repeated rubbing and sanding blended the color and increased uniformity throughout the disc. 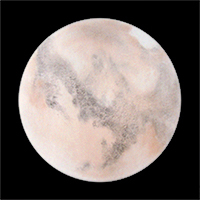 When drawing the planet, a wad of red-stained chamois restored color lost to erasures, or added color where needed. Also used were several chunks of graphite stick, a couple of artist�s erasers, and a favorite 4B graphite pencil that is almost greasy in its smoothness. In the process of sketching, the potter in me came to think of Mars as a magnificent earthen jug turning upon a celestial wheel, whose varied surface I was hastily translating onto a paper plate. Just try to capture a hemisphere in mid-pirouette! There was no chance of overworking these drawings. Although enough tabulas rosas for several night�s work had been carefully groomed, the dome remained closed after my first solo session because of ash fallout from a Napa Valley forest fire. Only three drawings were produced as a result, but this rare evening was one of the most memorable and satisfying in my life.